If you’ve missed hearing Jim Leyland’s gravely voice churning up prefabricated media narratives like rocks in a cement mixer, then do not miss the MLB Network special on Leyland, which airs tonight at 9:00 Eastern. In advance of the program, Leyland appeared today on MLB Network’s High Heat, refusing to take the bait as host Christopher “Mad Dog” Russo persistently and loudly (as expected) ran Leyland through some of the tougher moments in his more than twenty years as a major-league manager. This is going to be a good show no matter what, but I will be a little disappointed if we don’t get to see Leyland singing (or not singing) or talking about his sweet pre-game ritual or post-game dancing. Part of the perceived strength of last year’s Detroit Tigers offense came from the arrangement of the middle of the batting order: Miguel Cabrera, Prince Fielder, and Victor Martinez; two huge bats following the biggest one in the game. The idea was that Fielder, batting fourth, “protected” Cabrera in the three hole because he was there to make pitchers pay if they wanted to simply intentionally walk Cabrera to mitigate his potent power, the same way pitchers treated Barry Bonds a decade a go. With Fielder there to “protect” Cabrera, the theory went, Cabrera’s offensive numbers should improve because pitchers would have to be more aggressive with him. This is not a new idea, but after seeing a recent picture of Barry Bonds, it seemed worth reprising. Here’s Bonds in 1992. Age 28. Bonds in 2007. Age 43. Besides having ballooned physically, Bonds is doing a coupe of interesting things here. One, he is wearing a Rod Beck memorial patch, like the rest of his teammates did that year. That’s how I dated this photo. Two, he apparently was wearing Ryan Klesko’s batting helmet. Klesko and Bonds were teammates for one year. Now comes word that Bonds over the weekend was hanging around in Aspen and spending time on his bike in the mountains. How much does he weigh now? The guy in the neon green shirt is 6-5, 185. Bonds was said to be 6-2, 228 in 2007. Time to invest in Bonds again? 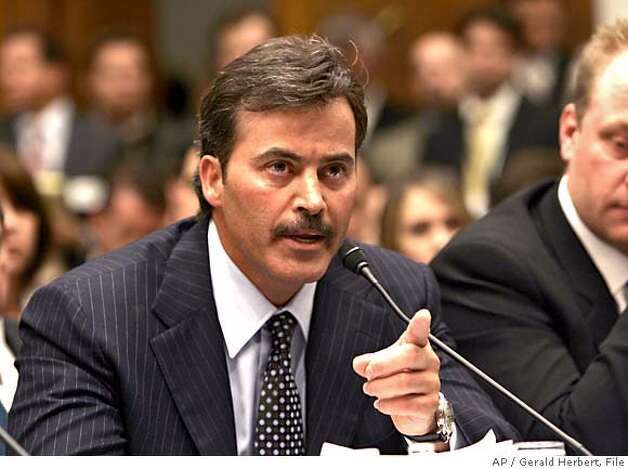 ESPN Dallas/Fort Worth reports that Rafael Palmeiro, apropos of nothing at all, said that Barry Bonds and Roger Clemens belong in the baseball Hall of Fame. Palmeiro certainly doesn’t have any personal interest in Bonds’ and Clemens’ induction. It’s not as though, if Bonds and Clemens don’t get in, Palmeiro has no shot at all, or anything. Palmeiro was voted on just 11 percent of the ballots in his first attempt at the Hall of Fame in 2011. He received 12.6 percent in 2012, well short of the 75 percent needed from voting members of the Baseball Writers Association of America to make it in. Oh well. Maybe he wasn’t going to make it anyway, regardless of what happens to those who rode the PED wave to higher heights than he. Why he wants to cast his lot with these two is beyond me, though, as is how exactly we let him finger-wave his way back into the news, if only for a moment. The prequel and pretension past, along with the run-of-the-mill fodder, we found ourselves– thanks to a reader tip– staring down the barrel of epiloguist Jen Floyd Engel’s perspective-granting long lens in the form of her piece for Fox Sports, “Blaming Saints is height of hypocrisy.” Looking back on the NFL bounty story, Engel seeks to contextualize the thematic strands of that story with those of another and mix in a bit of stern-faced judgment for total effect. Standard-issue English 110. I can’t specifically recall reading anything of Engel’s before, although I surely have, but the first stumbling point for me came before I even made it to the text. Maybe I still am crotchety after Charles P. Pierce’s bit on this matter, but as someone slightly out of the mold in the nomenclature realm, I have to wonder why Engel goes (presumably) nickname, middle name, last name. If she wants distinction, isn’t Jennifer Floyd Engel the way to do it? For example, Pierce doesn’t use Chuck P. Pierce (although Google suggests he sometimes uses Charlie, but where he does, he drops the middle initial (Google doesn’t know Pierce’s full middle name)). But ok, enough. After “soak[ing] in all of the moral outrage and denunciations” of NOLA football, Engel shares with us her “first thought”: “Who will play Barry Bonds in this ‘sports tragedy’”? Huh? Hopefully no one! Why would anyone bring Barry Bonds into this? Watch out sophomore seminar in comparative literature, here comes one now.